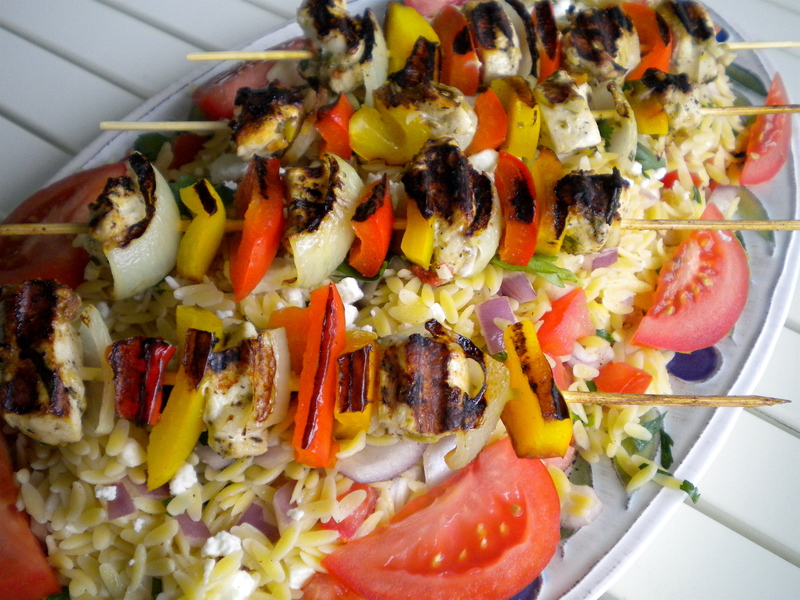 Greek Chicken Kebabs – Voila! We all know it’s picnic season, but let’s not forget grilling season! Here in our apartment we have a great balcony but no grill. On the flipside, we do have a great panini press that has served as our indoor grill. We’ve had great success with hot dogs, turkey burgers and now kebabs. These are dang good, really easy to make and a perfect way to start the grilling season. 1. In a small bowl combine the garlic, oregano, rosemary, tapenade, red pepper flakes, 1 tablespoon lemon zest and the juice of 1 lemon with about 1/3 cup EVOO. 2. Season the chicken with salt and pepper. Add to marinade and coat the evenly. Cover with saran and let marinate for at 30 minutes. 3. Skewer chicken on metal skewers, alternating with the peppers and onion. Grill the chicken 10 to 12 minutes until firm and juices run clear, turning the kabobs frequently. Serve with this orzo salad and you’ve got it made.